The Factor Trees Gizmo has two modes. In Factor mode, you can create factor trees to factor composite numbers into primes. In Build mode, you can build numbers by multiplying primes together. Can you build all composite numbers up to 50? Any whole composite number up to 999 can be factored or built with the Gizmo. Understand that some numbers, called prime numbers, have only two factors - one and themselves. Understand that other numbers, called composite numbers, have multiple prime factors. Factor composite numbers into prime numbers. Build composite numbers by multiplying primes. Use factors to understand multiples and divisibility. Use the attached item to quickly assess student understanding of the Gizmo's vocabulary. This is for whole class instruction. It helps introduce the terms, Prime and Composite. It is a revised... (more) copy of Elsie's. 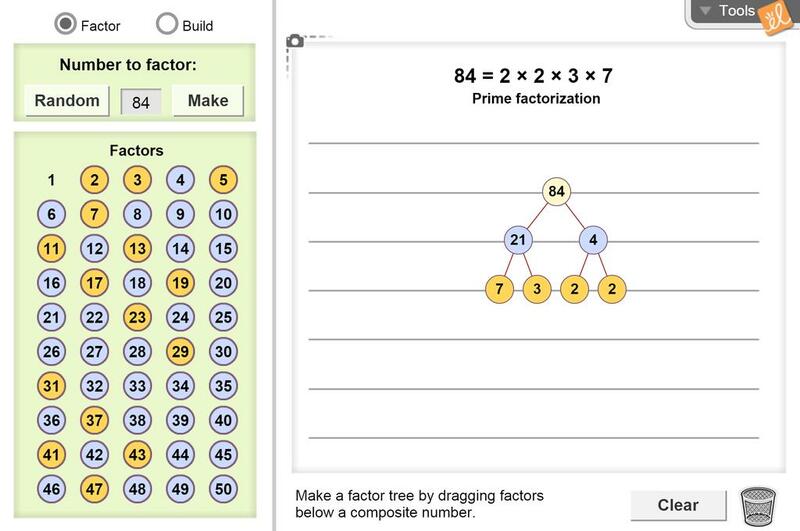 Learn how to create a factor tree to find the prime factorization. A great tool to use for a split grade. This Gizmo is ideal for elementary students to play with when first learning the difference between prime and composite numbers. My favorite tool for prime factorization. I used this as part of my bell work they loved it. Fun and a great way to review prime factorization.